Forty years after it was made, its producer recalls the travails of making Ray's first Hindi film. A humble worker of Bollywood had once told me “Sahib, acchi filmein toh sab hi banane jaata hai; khali kuch ban jaati hai. [Everybody wants to make good films, only few good ones get made!]”. Likewise, I did not go to Satyajit Ray to consciously make a world classic; it just got made. 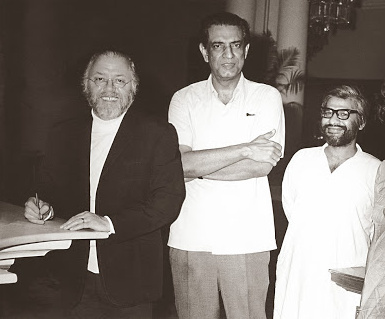 After my first film, Rajnigandha (1974), became an unexpected ‘sleeper’ of the year, I approached my friend Director Tinnu Anand, who had been Ray’s assistant for five years, with an intuitive idea – to request Ray to make a film in Hindi or English even though he had for years refused to do it for the great veterans of industry. When Tinnu asked me whether I would produce one in Bengali if Ray did not agree to do the film in Hindi or English, I had replied: “Tinnu, I just want to work with him even if it is on a Bengali film”. We met him one morning in Calcutta and I blurted out, “Sir, I would like you to make a film in Hindi because I am in the Hindi film industry, or in English, or if not, then in Bengali.” As soon as I heard what was coming out of my mouth I panicked at the disjointed, abrupt and almost rude sentences. Oh, you’ve blown it, Suresh! Better get out of here fast before you sink into the floor with embarrassment or die of frustration at having messed up your big chance. It turned out that Ray had thought of making a film on Prem Chand’s long story Shatranj Ke Khilari ever since he had read it in English in a published anthology of the writer’s work. “But I warn you it’s going to be a very expensive film. You may not want to spend so much money on your first film with me. We can look for a story that will be cheaper to produce,” he said. But I was already visualising finding the first slave owner and/or buyer of my organs who will have me for there was no way in which I was refusing to do this film. It was the most expensive film Ray ever made. The expense mainly went into reconstructing the period – Lucknow in the 19th century – requiring expensive sets, costumes and jewellery. The expense of the film also made it imperative to take stars because only then would the film become ‘saleable’ and cover its cost. The stars took minimal fees as did Ray, who himself told me what he would take. Right in beginning the shooting schedules went haywire – Sanjeev Kumar, who was playing Mirza Sajjad Ali, had a heart attack and Amjad Khan, who was playing the role of Wajid Ali Shah, had an accident while driving from Bombay to Goa for a shooting schedule. In his film, he was the master of all he surveyed – from the script to the casting, to operating the camera, editing the film and composing the music. He even sketched the sets and the costumes. Actors were not only in awe of his legendary creativity but also loved him for his firm gentleness and extreme consideration. If a shot was to be repeated he would first always say it was good, then ask the cameraman and sound recordist if it was technically sound. Only then he would gently say: “But will you do one more again for me, please?” After this, all actors, from Sir Richard Attenborough to Shabana Azmi would become ecstatic putty in his sure hands. He was also a compassionate and kind man, almost like a Bodhisattva. In fact that is the impression I always got of him whenever I was in his presence – that of an ancient Rishi composing the shastras of cinema. Today of course his massive oeuvre of cinema, fiction, numerous designs of book covers, and invention of original type sets such as Ray Roman and Ray Bizarre are like the shastras of a modern Renaissance Rishi. I had sold the film ‘under-production’ for most of India to a consortium of top distributors. Under the agreement I was obliged to show them the preview of the film before release. Huge hoardings had been put up all over Bombay. After seeing the film they unilaterally refused to release the film and asked for the money given by them during the production to be refunded. This brought all our collective euphoria down with a painful thud. It affected Ray very deeply as he could not understand the meanness and callousness of this act. Given the momentum of the immense publicity and the star cast [remember Sanjeev Kumar and Amjad Khan were the stars one of the iconic blockbusters of all time Sholay (1975)], Shatranj’s initial collections should have been enough to make the film a ‘breakeven’ and recover its investment. This experience turned him off attempting another non-Bengali film for a long time. Later we did agree to do another Hindi film which unfortunately remained stillborn, as he had a heart attack during the filming of Ghaire Bhaire. After his bypass surgery by the famous surgeon and pioneer Dr. Michael DeBakey, his doctors forbid him from working away from Calcutta. The projected film required extensive shooting in the rural areas of the tribal districts of Bihar. His last three films were shot in the studios of Calcutta. A bit of outdoor shooting was done only within the motorable distances of Calcutta. I had the worst time of my career as I was saddled with a huge debt. Ray would regularly call me to ask about my physical and financial health. Somehow he felt he was responsible for my travails in spite my assuring him that only 33% of the films produced worldwide ever get their money back, and that I had entered the production knowing this full well. And that I would do it once again if given another chance to work with him. It is only the extremely fortunate, born with high Karma, who get to work with one of the great cinema masters of all time. I was no different in my feelings for him than Shabana, who, when told about her role in the film was small, said: “Ray Sahib ke liye toh mein jharoo marne ke liye tayaar hoon [For Ray I am even ready to sweep the floor].” For that is what the shishyas of the ancient Rishis did just to be in the glow of the master. Suresh Jindal’s book on the making of Shatranj ke Khiladi (Harper Collins) will release in October.